Troops of 119 Task Force Battalion, 8 Division Nigerian Army, deployed at Kangarwa, Kukawa area of Borno State, have neutralized 13 Boko Haram terrorists in a counter-attack by the troops. Unfortunately, 1 gallant soldier paid the supreme price during the encounter, while 3 soldiers were wounded in action. The offensive which began at about 4.00pm and lasted for roughly four hours, necessitated the troops calling for air support to which the Nigerian Air Force (NAF) promptly responded by dispatching an Intelligence Surveillance and reconnaissance (ISR) aircraft and a Ground Attack Fighter Aircraft in support of the ground offensive. The fierce counter also saw some insurgents fleeing with gunshot wounds and abandoning logistics and weapons. 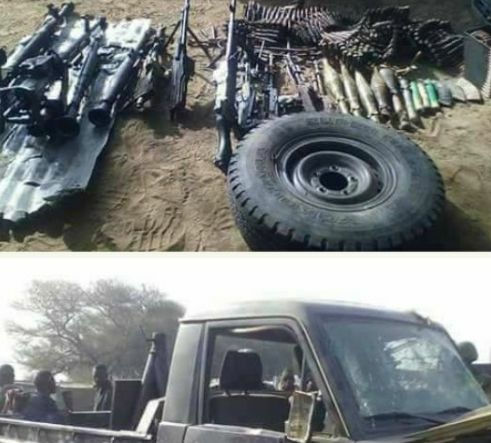 The troops also neutralized 2 Hilux vehicles belonging to the insurgents and recovered the following; a Hilux vehicle, 1 Browning Machine Gun (BMG), 1 Anti Aircraft Gun (AAG), 2 General Purpose Machine Guns (GPMG), 1 Light Machine Gun (LMG), 2 Rocket Propelled Guns Seven (RPG 7) tubes and bombs, 5 AK-47 Rifles and 550 Rounds of Anti-Aircraft Gun ammunition.